Retiring Captain John Steinmetz honored Reviewed by Edgeville Buzz on March 8, 2011 . 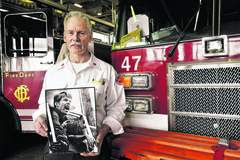 Shouting for help as he cradled the body of a dying girl in the fourth-floor window of a burning building, John Steinmetz was captured in an iconic 1979 Sun-Times photo that embodied the bravery of Chicago’s firefighters. The mustache has since grayed, and his face now wears a few wrinkles, but Capt. Steinmetz was unmistakably still the same strong, wiry man Sunday morning when he showed up for the final shift of his 34-year career at his Edgewater firehouse. But more than three decades fighting fires could not prepare the 63-year-old for the surprise waiting at his final roll call: his two sons, Eric and Chris, standing at attention with the Engine 70 crew Steinmetz usually commands. In an exception to the rule that prevents family members working the same shift together, the proud brothers — who work as a paramedic and a firefighter on the South Side — were assigned to work Sunday at their father’s station as part of a moving tribute that saw dozens of firefighters honor the respected veteran.